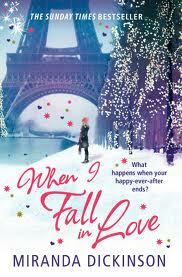 Miranda is back this year with another fantastic read When I Fall in Love, this lady continually brings us stunning covers containing beautiful storylines you have got to love her. ...but eighteen months on from the biggest challenge of her life, she is doing just that –because she made a promise to the person who believed in her the most. Determined to step into her uncertain future, Elsie meets handsome Oliver Hogarth, who seems intent on winning her heart; she inadvertently founds a choir, and overcomes obstacles – most of which involve arrogant Torin Stewart. Then a heartfelt request brings her to Paris – and the final item on ‘The List’ that she never dared complete. Can Elsie follow her heart and put her past to rest? I loved our heroine in this book, Elsie has just had the toughest eighteen months of her life but she now has to take the steps to start building a new life. Out of all of the storylines Miranda has brought us this is the one that touched my heart the most. Elsie has an edge of vulnerability about her but after finding out what it is that has occurred in her life you actually think how well she is coping and you can’t help but hope that with each step she takes in building her new life she will start to mend her heartache and start to find happiness. She is a very selfless character and is instantly loveable. I have to say this is one of the rare books where I loved each and individual character in this book from members of the Maynard family who really show the meaning of family support, to each member of Elsie’s new venture all who are very different from each other and bring a something different to the storyline. I loved both Torin and Oliver who were our male characters and I never quite knew all the way through who if either of them Elsie would open her heart to. Miranda’s descriptive writing is back again giving us a mini tour of Paris which has made me rather excited about my trip there for New Year now. It is quite clear that Miranda has brought her own personal interests in music and singing into this book and I think that is why the book flows so well because it was so natural for her to right about something that is a great interest to her. I was hoping that there would be a little hint of festivity in this book but unfortunately there wasn’t any, and yet I still thoroughly enjoyed this touching read. A very emotional and moving read that I highly recommend.